Plenty of action, featuring our collection of passenger and industrial rolling stock and locomotives, for you all to watch, video, or photograph. Plus, demonstration runs with the Road Machines contractors' monorail. If you would like to have a go at driving one of our locos, then we have just the thing - Driver for a Fiver - exactly what it says. Come and give it a try! A reappraisal of our late season events results in our Autumn ITD reverting to the customary mid-October date. Plenty of action, featuring our collection of passenger and industrial rolling stock and locomotives, for you all to watch, video, or photograph. Plus, demonstration runs with the Road Machines contractors' monorail. And Driver for a Fiver will once again be a feature of the event. Go on, give it a try; you know you want to. You can download the list of steam dates for 2019. Note: Operation of steam trains is subject to the availability of locomotives and appropriately qualified volunteer crews. At Railway Gala Weekend in July, besides the 100th birthday celebrations, we launched our Just Giving campaign to fund the extensive repairs now needed for our Bagnall locomotive Peter (WB2067/1918) once the 10-year boiler certificate expires later this year. Although it is unlikely that a completely new boiler will be required, the amount of work necessary will still be expensive. Peter worked our trains during the pre-Christmas opening with the final fire being dropped after service on 16 December 2018. 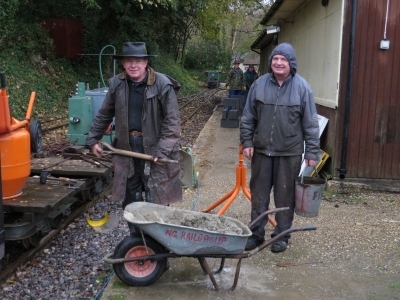 Peter has been a popular attraction at Amberley since 1993 and with your generous donations it should not be too long before he is in front-line service once again. We hope it is not too presumptuous of us to thank you in advance for your generosity. Our very own FAQ - what do you do in the winter? Click here to find out the real truth! These links will take you to a series of slideshows of the Museum's railway as it was when we were all a lot younger! The chronology should be about right but if you spot any glaring errors or inconsistencies, then please let us know. Thanks to Richard Cossey for the loan of the photographs from the Brockham Museum, the 1982-85 and 1988 sections. The Museum's Official Website is here. Did we mention that you can get your Museum entry tickets on-line via the Museum website? Use this link. LINKS: The following may be of interest.